While manual garage doors are practical and affordable, there is no denying the convenience brought by door openers. Here at Garage Door Repair Sanford, we often encourage our clients to upgrade to an automatic opener system if they have the budget for it. Contrary to what people think, it is not a luxury, but a great investment. It makes door operation more convenient and lessens the risk of problems caused by manhandling and overuse. Automatic garage door openers require more care and maintenance compared to manually operated ones. This is because problems may not only lie on the door itself, but on the transmitter, or the remote control. Opener systems also introduce new technology that can break if not used properly. We believe that the first step in having a hassle-free, long-lasting opener system is to start the installation right. 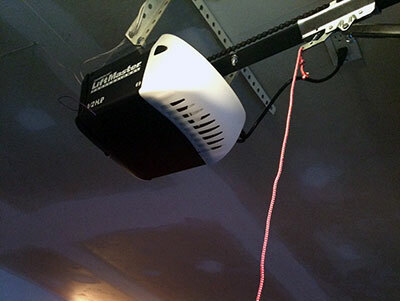 We offer professional garage door opener installation services for residential and commercial properties. As experts in the industry, we are experienced in handling all brands of openers available. That is why we personally recommend and use the following brands for our installation: Marantec, Liftmaster, Genie, Sears, Craftsman and Chamberlain. These brands are renowned for opener systems that are affordable, easy to use, and durable. An automatic garage door system, when installed properly, will pose less problems and safety hazards in the future. This is why we train our reliable technicians carefully until they master our company's meticulous and thorough installation procedures and methods. This is to ensure that no stone is left unturned and that your new opener system is fully functional and perfectly safe for use. Apart from installations, we also offer emergency services for opener system-related repairs and part replacement. Misuse, harsh weather conditions and wear and tear can break down the parts of even the best garage door systems, and it is important to spot these problems early, before they ruin the entire system. We accommodate inspection and maintenance calls for all our clients and conduct on-the-spot repair and part replacement for any potential problems and safety risks. We also use the same trusted brands for all our repairs and replacement, not only for compatibility's sake, but because they are the best the industry has to offer. Early detection of problems, plus prompt response from our professional technicians mean our clients save money and time, which is our company's priority. If you are interested in our top of the line garage door opener installation and repair services, call us today or visit our website for more information.